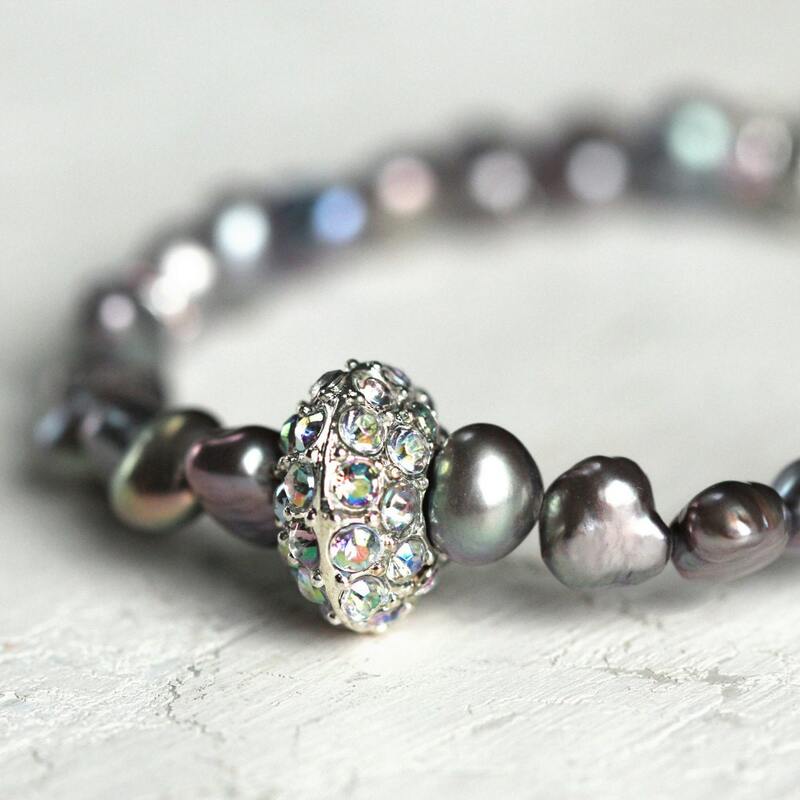 This sleek and sophisticated pearl and pave bracelet is the epitome of easy, organic elegance - ideal for adding a stylish flair to any outfit. 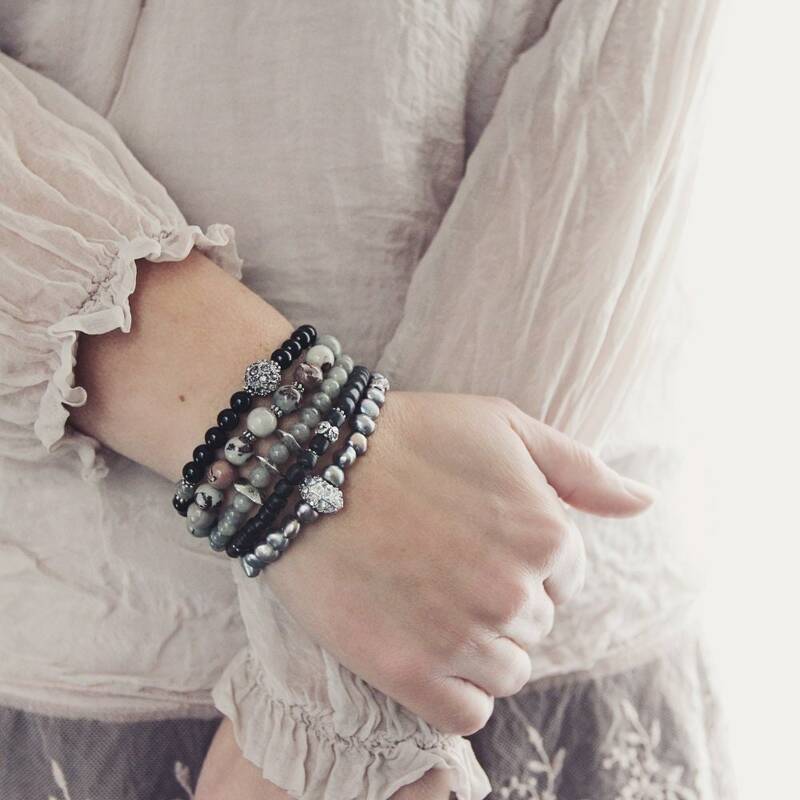 Perfect worn alone, but sensational layered and stacked with other bracelets, this crystal and silver pave bracelet is a beautiful, classy accessory! 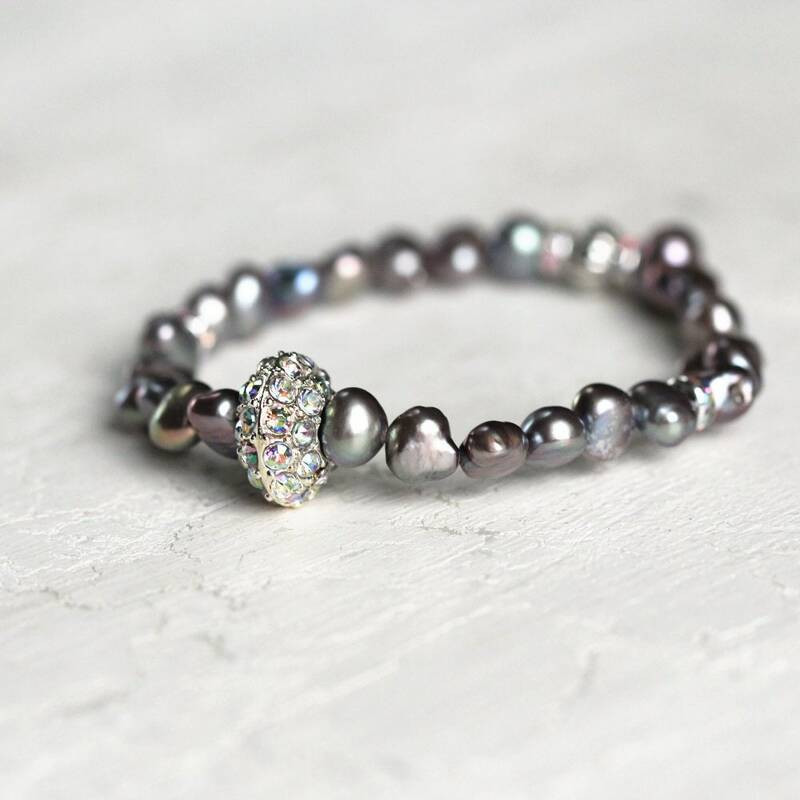 'Pave' settings consist of lots of small stones, often diamonds, set closely together in metal. The jeweler pierces the metal with many holes in a honeycomb pattern, and after hand setting the stones into the holes, the jeweler then uses little beads of the metal around each stone to secure them in place. The end result is a gorgeous jewelery piece that appears to be paved with gemstones. I love layering these bracelets and trying different combinations, and this is a wonderful, neutral piece to accent all other colours. 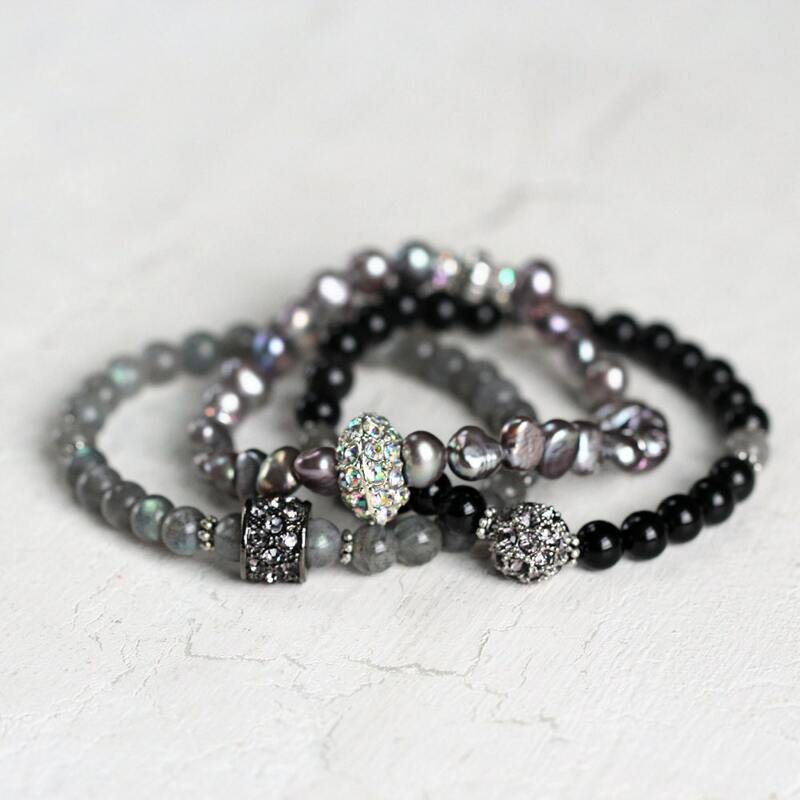 All Artique Boutique bracelets are designed to mix and match together, so all you need to do is pick your colours and have some fun playing with the possibilities! And, even better, no more struggling with fiddly clasps - each bracelet stretches so you can easily roll it on and off! ► MIX & MATCH! 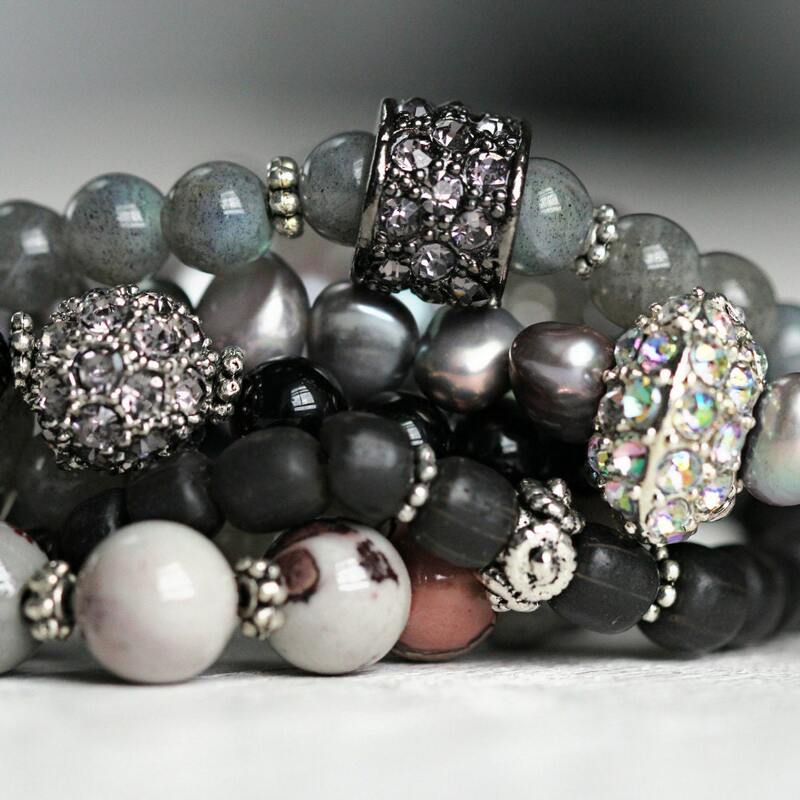 - I just love stacking bracelets! You can have so much fun wearing them alone or trying different combinations. All of the bracelets in my shop are designed to mix and match together, so all you need to do is pick your colours and have some fun playing with the possibilities! ► SIZE - This bracelet is approximately 7 inches, and will fit a wrist between 5.5" (loosely) and 7" (snugly). It looks great whether it's a snug fit or loose fit. However, if you would like custom-sizing, just send me a message and I'll make them specially for you! ► THE PERFECT GIFT - These bracelets make perfect presents for loved-ones, friends, family, acquaintances, or co-workers. They are so versatile, and can be worn with so many different colours and outfits, blending seamlessly with the changing fashions and seasons - they'll never look outdated! Is this is a gift? Then let me take care of that for you! These bracelets come beautifully boxed and gift-wrapped, and I can add a personalised message from you, inside a lovely matching card. Simply include all the relevant details and instructions when you check out. I can also send the item directly to your recipient, saving you some time and money! ♥ Handmade especially for you, by the sea in Cornwall, England, UK. It's very important to me that you are happy with your Artique Boutique jewelery, so I offer a 100% money back guarantee if you buy something only to find that you're not happy with it!